Chelsea Cobbler was established in 1967 by the designers Richard Smith and Mandy Wilkins. They catered for clients who wanted distinctive shoes to accessorize their outfits. 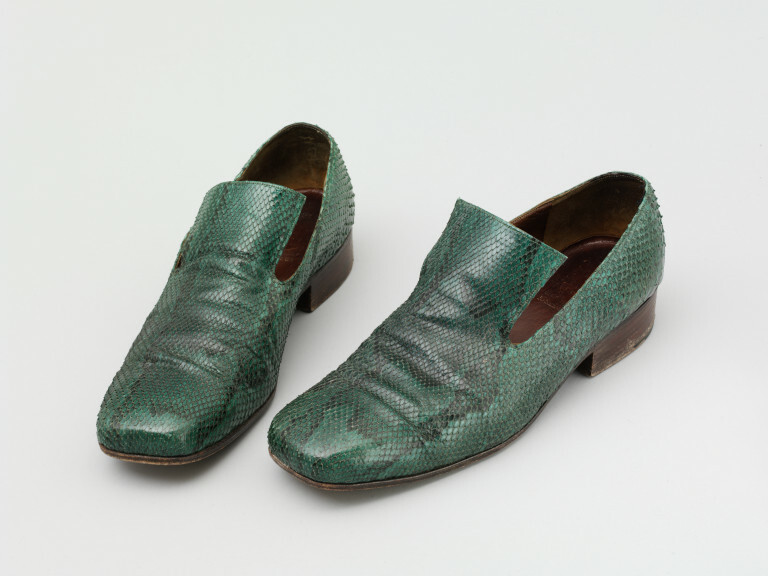 These dramatic dark green lizard skin shoes were purchased and worn by the interior designer David Mlinaric. The late 1960s saw young men enjoying a greater freedom in dress. More traditionally 'feminine' fabrics such as velvet and chiffon, brighter colours, and more figure-conscious styles were gleefully appropriated for their wardrobes. These shoes, with their simple styling but unexpected colour and material, are typical of clothes found in the new male wardrobes. Pair of men's shoes of dark green lizard skin. Pumps with a brown leather interior. 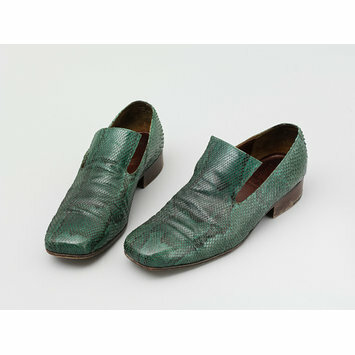 These dark green lizard skin shoes were purchased and worn by the interior designer David Mlinaric. Chelsea Cobbler was established in 1967 by the designers Richard Smith and Mandy Wilkins. They catered for clients who wanted distinctive shoes to accessorize their outfits.